We investigate a multi-physics sensor fusion technique to provide accurate prognostics for highly integrated power electronic converters using Silicon Carbide switching semiconductors for electric vehicles. The real-time estimating state of health and the true age of the converter, will allow the vehicle management system to intelligently adjust the available power and cooling requirements. This will be achieved through dynamically adjusting the safe operating area of the power converter based on the prevailing conditions and records of previous ageing. 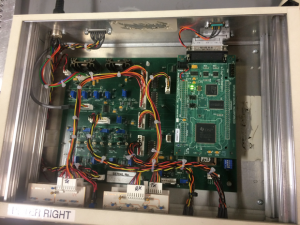 We develop a sensing platform to quantify the health status of power electronic modules with xEV drive systems. 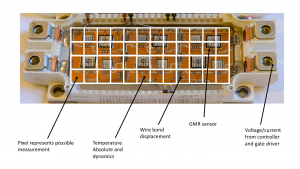 This will be realised via an array of multi physical sensors to generate a spatially sparse IMAGE of measurements which consist of temperature, electrical quantities (V, I, Z) and mechanical displacement (wire bond movement/device deformity) on the power module. The images are scanned at different time scales and multi-sensor data fusion techniques are used to extract higher resolution measurements. We reconstruct a detailed level of measured data (Temp, displacement, voltage, current, magnetic field) and using physical models for reconstruction. Application of the Field Orientated Control (FOC) to the AC induction drive results in the instant control of a high performance drive, namely short response time with neither the motor nor the power component oversized. The ability to achieve such control renders the asynchronous drive Key advantages such as the extended speed range, the direct torque and flux control and the excellent dynamic behaviour in both transient and steady-state condition. We investigate a complete integration of the theoretical and practical aspects of the indirect field oriented control (IFOC) application for SiC-based Induction motor drives.